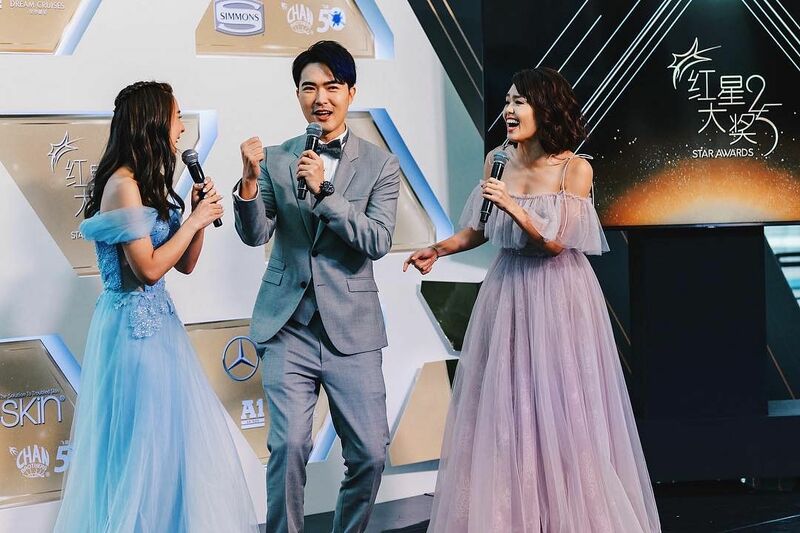 It was a night of glitz and glamour at the annual Star Awards ceremony, which saw the best of the best gather to celebrate the stars of Singapore’s Mandarin entertainment industry. Here’s what went down in the three-hour long show. About 45 minutes into the show, the mood in the auditorium turned sombre as the audience spent some time paying tribute to the late actor Aloysius Pang. Fellow Noon Talk artistes sang a tribute (Xiao Ren Wu de Xin Sheng), as a video montage of his past interviews and works played in the background. The emotional sequence brought tears to many in the audience, including his manager Dasmond Koh, Chen Shucheng, Ian Fang, girlfriend Jaylee Woo and more. Actor Shane Pow was hospitalised on Saturday morning after he was apparently hurt in a dispute with a fellow patron at the opening weekend of Marquee Singapore nightclub in Marina Bay. According to Channel 8 news, he had reportedly bumped into the patron and spilled his drink on the latter’s shoes. Despite apologising, Shane was assaulted and taken to the hospital. Although he was discharged on Sunday, a Mediacorp spokesperson said he will not attend the ceremony. Shane was nominated for Best Supporting Actor for his role in Mind Matters; the award went to Chen Shucheng in the end for his role in A Million Dollar Dream. Hong Kong-Australian starlet, Cecilia Cheung, F4’s Jerry Yan, Hong Kong TVB star Roger Kwok, 5566’s Tony Sun and Story Of Yanxi Palace’s Wu Jinyan were some of the overseas stars making a guest appearance at the Star Awards this year. Cecilia was spotted making her rounds around Singapore in a series of Instagram stories. In one, she was digging into what appears to be roast meat rice while others at the table ordered bak kut teh at a kopitiam. In another, she seemed to be having supper at Lau Pa Sat. She showed up in a gorgeous backless ruffle dress while Jerry was in a bold pastel pink suit. Frequent online shoppers will recognise Jasmine Sim as the face behind local fashion brand Love, Bonito. The rising star started her career as the brand’s model and is also the first runner-up in The New Paper New Face 2014. She began dabbling in acting last year, and has been in dramas such as Doppleganger alongside star couple Fann Wong and Christopher Lee. Her work paid off — she snagged the Best Newcomer Award for her role as the pair’s daughter. I’m sure we’ll see more of this up-and-coming actress soon. ALSO READ: WHAT DOES IT TAKE TO BE A GREAT MODEL? Attended a recruitment event with @AIASingapore on 15 Aug to share the importance of having insurance coverage. When I was younger, I didn’t believe in the importance of insurance. I only took up my 1st health insurance policy in 1995 after much persuasion from an agent friend of mine. 10 years ago, I was diagnosed with Kennedy’s disease, a muscular dystrophy illness. Though I was able to make some medical claims after my diagnosis, the payout was not sufficient to cover my medical bills, as I did not have adequate coverage. So, I’d advise you to talk to your consultant on your insurance needs. With my sharing, I hope you will be inspired to become a Financial Services Consultant to help insure as many lives as possible. This is truly #NotJustAnotherJob. Find out more about this career at aia.com.sg/NotJustAnotherJob. What a revival! The top 10 Most Popular List saw the coveted spots handed out to veteran artistes for the first time in many many years. Chen Xiu Huan returns to the list after she was included in the Top 10 showing in 1994 — the very first Star Awards ceremony. “I never thought 25 years later I’d be back on this stage,” she exclaimed in her speech, visibly touched. Another surprise of the evening was Hong Hui Fang, Zhu Hou Ren and Chen Shucheng, all of whom snagged their first ever top 10 spots in their decades-long career. Expressing her shock, Hui Fang said she has been here for more than 30 years and nominated 25 times, but has never gotten one of these. “I was thinking I’d give myself a special award this year!” she joked. “This didn’t come without hard work, thank you to everyone who voted for me,” she said, as she kissed the award. What a great end to this year’s ceremony — old is indeed gold. Now in its 25th year, the annual Star Awards ceremony — Singapore’s iconic and most important awards for the Mandarin entertainment scene — is back. Celebrating the best in Singapore’s TV, the night is also a time for celebrities to step out in their best garb. But who’s hot and who flopped? Scroll on for our best dressed curation. Dressed in an ethereal all-white lace dress, Paige Chua looked absolutely radiant. The cinched waist helped accentuate her hourglass silhouette while the plunging v-neckline and lace trimming added a dose of feminine sensuality. She finished the look with complementary rose gold and mother-of-pearl accessories with pave diamonds from Bulgari Serpenti that added a touch of elegance for a pared down yet all-round stylish look. Looking like a regal princess, Cynthia Koh showed off her best assets — her shoulder and cleavage — in this beautiful strapless dress from Style Lease. We love the midnight blue shade that made her the picture of sophistication, while the dramatic ruffled skirt added a flair befitting of the celebratory occasion. The drop pendant helped further draw attention to her chest — we like. A simple yet elegant floral dress was Xiang Yun’s garment of choice, but it was on point. Matched with simple pearl studs with her hair in curls, the veteran actress looked like a glamorous actress from the '60s. She certainly schooled us on how to look amazing and appropriate for her age, without looking matronly. Decked in a glittery sequin number from Chanel, model-turned-actress Sheila Sim nailed the perfect award-ceremony look. Not only was the plunging neckline a showstopper, her accompanying Chanel accessories and slicked hair-do added a modern, almost rocker-like edge that made her look fierce AF. Vogue. Blush pink is certainly Quan Yi Fong’s colour. Appearing on the red carpet in a feminine one-shoulder dress that exemplified her collarbone, the hue and the sparkles brightened her mien and made her look polished and sharp. While it might look like a simple black and white ensemble from Roksanda, the outfit of Wu Jinyan, breakout star of the Story of Yanxi Palace, sports many interesting contrasting details. The off-white flowy tulle skirt with abstract print was light and airy, while the black sequin top added weight and shine to outfit. The waist-cinching belt was a tasteful final touch. Simply stunning. Here, our list of celebrities who didn't quite make the cut. Perhaps Hong Ling was trying to channel Belle from Beauty and the Beast in this Jimmy Choo dress and accessories from Poh Heng Jewellery. Unfortunately, we couldn’t get behind this pale yellow creation (don’t get us started on the skirt) as it made the fresh-faced 24-year-old actress look older than she is. Looking like she was painted in glue and rolled in a bale of feathers, Felicia Chin’s outfit had good intentions but fell flat on the execution. The embellishments also made her waist look heavy and did not complement her svelte figure. Rebecca Lim has always blown us away with her amazing Star Award red carpet showings — which was why we expected a lot more from the actress than this black gown from Valentino. It wasn’t bad, it just wasn’t…spectacular. Perhaps the star was going for a simple, minimalist look, but we think the look could use a jewelled choker or drop pendant. That weird green-grey shade was not Vivian Lai’s best friend because it made the effervescent actress-host look a tad washed out. In addition, the shape of the dress was also not particularly flattering — it gave her usually petite figure an odd boxy silhouette. The usually poised Taiwanese female Mandopop singer-actress Bowie Tsang, who is the daughter of actor Eric Tsang, was in a rather ho-hum colourblock dress. While the cold-shoulder detail was flowy and feminine, the garb looked simply too ordinary and casual for the black-tie event. While we are glad the affable host and actress Kym Ng finally scored the All-Time Favourite Artiste win (congratulations! ), she didn’t win any points for her dressing The periwinkle pantsuit, albeit sharp, was nothing to shout at. In fact, we think it made her look rather out of place at the awards ceremony and reminiscent of a maître d’. While we applaud local singer Karena Yeo’s attempt at a quirky contrast by pairing a blazer with a tulle dress, the blazer she donned was ill-fitting and made her shoulders look excessively bulky. It didn’t help that the jacket didn’t cinch her waist either. We think a slim-fitting blazer with a belt to tighten her waist would have been a better choice. Too. Many. Details. From the powder pink colour to the oversized bow placed at the crotch to the oddly draped skirt and awkward slit, Chen Xiuhuan looked rather overwhelmed in this unflattering number. Still, props to the actress for giving this look a go. Don’t get us wrong — this is not a bad outfit. But we placed Aileen Tan on the worst dressed list simply because the silhouette was not flattering for the esteemed actress — it didn’t compliment her feminine curves but made her look boxy instead. We do love how powerful her shoulders look with the asymmetric top though. We weren’t a fan of Pan Lingling’s polka dot Carolina Herrera number which made her look like she was heading for an upscale weekend brunch rather than an awards ceremony. She looked sweet, but we need more.